Long® thermal-management solutions effectively reduce thermal load. With the ability to be remotely mounted, our high-performance oil coolers contribute to a more compact front-end vehicle design. Some models are designed specifically for transmission mounting through either the use of short oil lines and a mounting bracket or direct mounting with a center bolt. When oil line connections and mounting brackets are no longer required, warranty claims are reduced. Long has developed patented, high-efficiency “matrix construction” cooler designs. They are made up entirely of stamped core plates and are essentially “housing less,” which eliminates expensive deep drawn tanks and the complicated brazing joint between the tank and cover plate. 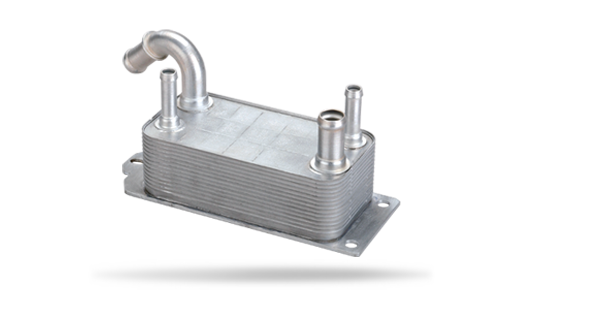 These compact matrix coolers are available in a range of sizes. Their configuration can be either round or rectangular for transmission mounting or remote mounting. Manufactured for center bolt mounting, these coolers have a donut shape and are readily available in a range of diameters. High performance is achieved through a unique stack-plate core in a deep drawn housing design. The heat exchange surface employs parallel ripples in the shape of involute curves for efficient energy transfer between oil and coolant, both flowing in a generally circular path.